This mod is an XML Tuning that changes the files mentioned in the Conflicts Section (see bottom). 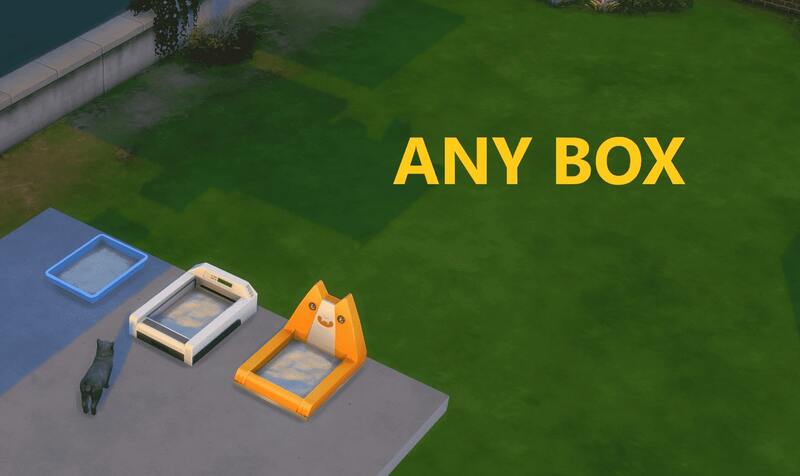 UPDATE This Mod has been confirmed to work with the 21st Feb 2019 Patch 1.50.67.1020, but it should work with any patch since the release of the Cats and Dogs pack. This probably went over MANY heads. As described in this Bug Report, there has always been a bug that does not let pets detect stuff on other floors other than they are currently on. By stuff I mean everything from Pet Bowls to Litter Boxes. This comes with a bad outcome when your pet really needs to alleviate their basic needs, usually leading to hunger and bladder issues. And I know you don't want your pet to experience those. 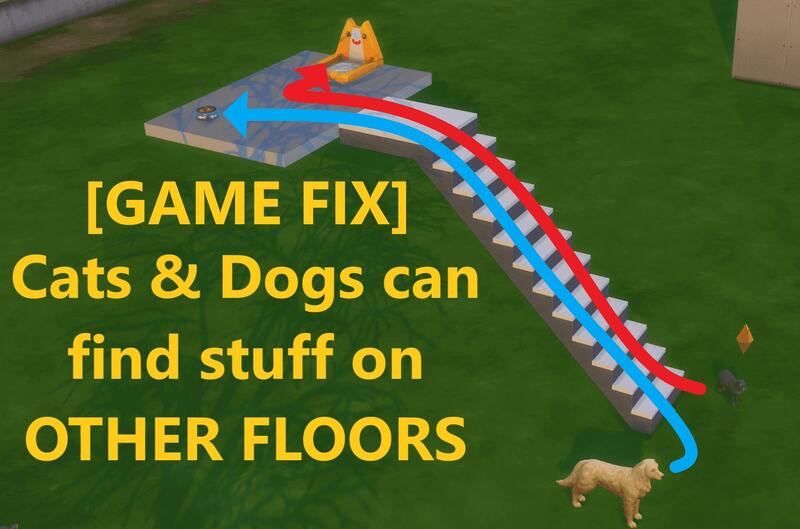 You probably haven't noticed this because (most probably) the pet went to the floor for a totally different reason, like follow around a Sim, or sniffing/investigating an object (also stated in the Bug Report above), thus reaching the same floor as the Litter Box or Pet Bowl, and then using it. This happens to both Cats and Dogs. If the pet doesn't do any of the preposed actions, they may find themselves stuck on a floor in a smelly puddle or starving, all of this while begging for help, despite the solution being right above (or below) them. Personally, I found it very annoying. Since the Bug Report needed Me Too's, which it did not get, I decided to no longer wait for a proper fix and try it myself. And oh boy have I succeeded. 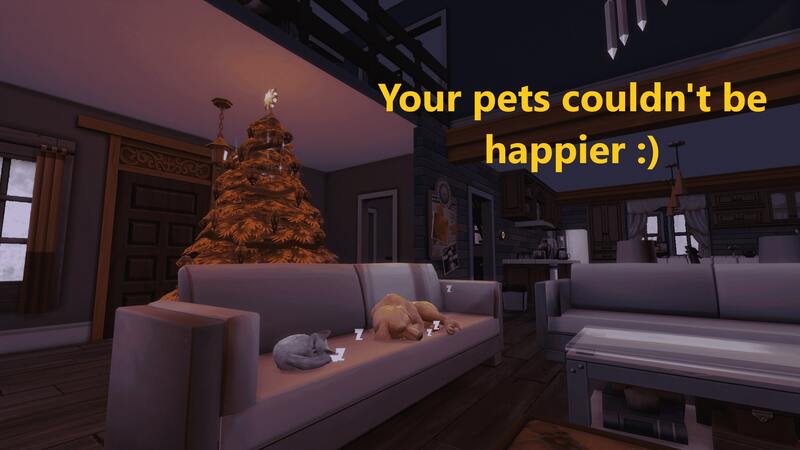 After being installed, your pets will be able to autonomously solve their needs properly if you provide them the required items (anywhere on the active lot). The Download is a simple .package that needs to be put in your Mods folder (or a Subfolder of the Mods folder - a SINGLE subfolder). 334 people have said thanks to Deathcofi for this download. I usually leave beds and bowls on the same floor for my main sim family. I did not realize this bug exists until simultaneously starting a roommate 'family' playthrough in a 2-story apartment. Thank you for this. I'll wait until it's confirmed this works with the latest patch, but eitherway well done! Definitely on my "must-have" mod list. Ahh wow. I am one of those who did not know this was an issue lol. Now that I know, I thank you profusely for the solution! lilbluecaboose I didn't realize that this was a real bug, I thought my cat was just dumb! Thanks! It's been tested with it (and the version number on the page is now up-to-date), so go ahead and try it! This explains So Much about one of my games. That cat is constantly on the verge of death and I couldn't figure out what was going on. Was wondering if this was indeed a bug or not, does this work when you tell your dog to go take a poop outside? Didn't see it in the tuning files. Thank you! I always have the litter boxes and food bowls in every main room on a lot and so had no idea this bug existed! Now I know about it, I thank you from the bottom of my heart! jrisetan Thank you for this. My cat keeps going red from hunger and I have to have my sim call her over to her food dish. It's about time! THANK YOU! I've always thought it was so dumb that pets can't climb the stairs. Works as intended, thank you! If you can (cause I can't for the life of me find it), there's the issue of pets not relieving their bladder on their own nor when you tell them to if they are in a different floor. They give the "route error" bubble. Same with independent pets that you click on "Let Out". I've definitely have that problem with dogs! It seems like you have to train them to go on their own? (I have a couple dogs who learned to relieve themselves on their own outside if they go orange and the problem is their Bladder if you ask "What's Wrong?" 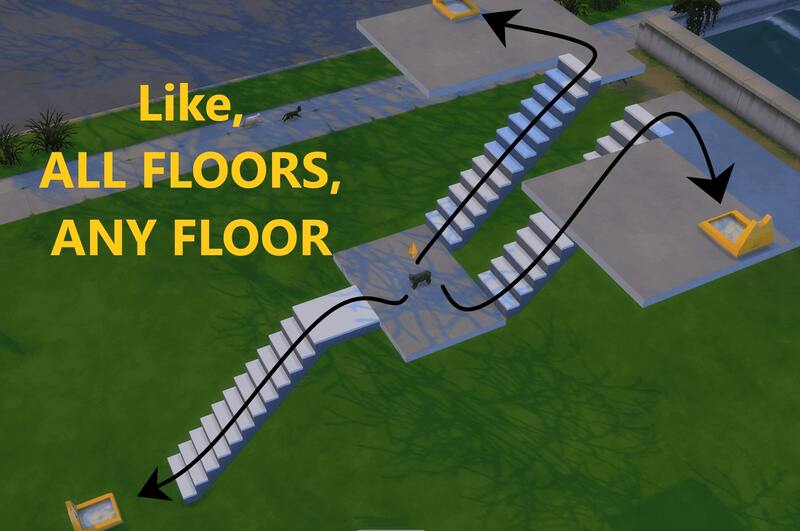 Anyway, does this work with the StrangerVille pre-patch? Seems to work fine with the pre-patch. It's definitely not a training problem, my dogs are trained and they still give the routing error, which is not something that typically shows up if it's working as intended. Confirmed to work with the 1.50.67.1020 patch! 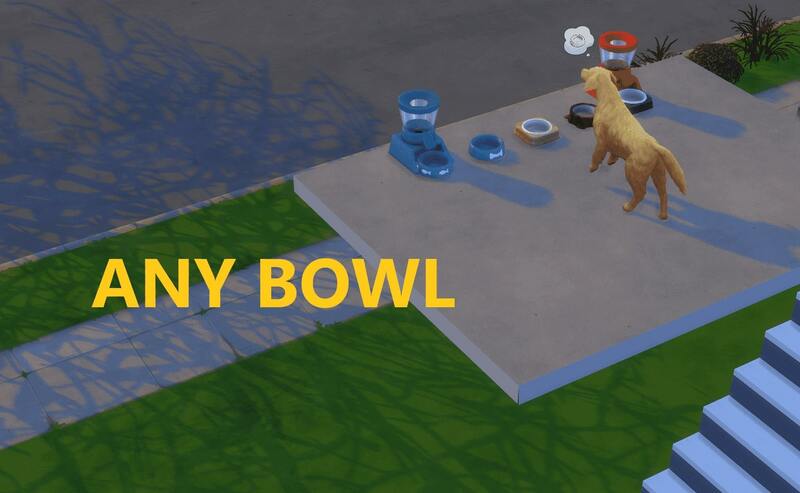 I was wondering why my pets were constantly complaining they were hungry and stuff when I have all these bowls/litter boxes. Thanks! Dokecls THANKS, OH MY GOD, THIS MOD IS VERY GOOD! Casper2k3 My dog kept dying of starvation, thank you for fixing this game that I paid $40 for....smh. Modders are the true mvp's â™¥â™¥â™¥, and deserve to be paid for the work (side eye at EA). PuffyAmi thank you for this fix! More slots on ALL EA SHELVES!! !